You Can Get the BEST? 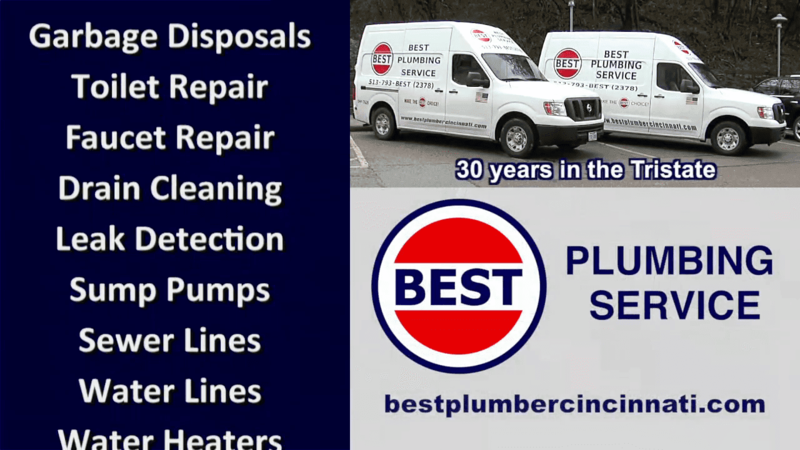 Contact BEST Plumbing Service of Cincinnati! *Cannot be combined with any other offers or specials. One coupon per customer, per visit. Excludes Home Warranty work or Emergency Service. Up to $100 off. Really impressed with the responsiveness and professional service. Brandon went out of his way to explain the trouble shooting steps he would take to identify low hot water pressure issue we were having throughout our entire house. Through a process of elimination it was determined to be a defective dialectic coupling on HW supply side. Brandon fixed this and we have great HW pressure throughout house again. Very pleased a new HW heater is not needed. I also like how BEST Plumbing sends arrival time and location updates via text so you know within 15 mins of when the technician will arrive. No need to wait at home all day. Will definitely be calling BEST Plumbing for any future service needs we may have. Thanks! Michael V. Michael V.